The Gnoming Librarian: Is Everyone Hanging Out Without Me? Another great car read on my short commute to work everyday. Just four discs! 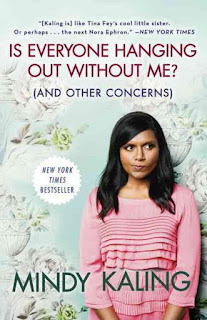 Mindy Kaling's collection of essays and musings, as opposed to Amy Poehler's in Yes, Please seemed more cohesive and put together...and to be honest, it was nice not having to hear the author complain about the writing process. Despite her successes, Mindy seems like the girl next door, the kind of person you might have grown up with. She's sincere yet witty has she dives into the sometimes awkward conversations about growing up the chubby girl, life in New York while starting her career, and the inner workings of show-business. I adore her on The Mindy Project, and this book really illuminated her sense of humor that shines through on the show. Dude. I'd kind of like to be her best friend. She's fierce yet ridiculous. She smart yet humble. And she's just the kind of girl I'd like to get into some shenanigans with. A must-read if you like comedian memoirs.